We received our invites today, they are great. Thanks very much for all your great work and I will recommend you to anyone in the future. All the best. Some examples of real wedding stationery that our brides and grooms have selected, and personalised from our range of wedding invitations for their weddings. 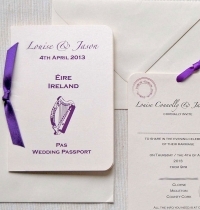 All of our invitation designs can be personalised to your specifications. We can change the colours of all of our cards and papers, our ribbon colours and textures and you can add your choice of embellishment. 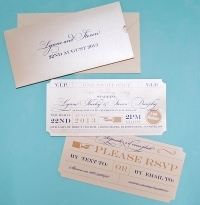 For some examples from our range of invitations that our lovely customers have personalised for their own weddings. For more customisation options: our selection of Ribbon Colours, our selection of Card Colours, and our Fonts & Wording. Alternatively if you are interested in creating something completely unique have a look at our recent Bespoke Stationery for inspiration.